November is National Adoption Month. This is the 19th year the U.S. has devoted a month to the celebration of adoptive families. Learn more about the history of adoption month and other adoption resources HERE. Adoption in America has a long history- learn more HERE. more than 500,000 children nationwide are in foster care? Learn more about foster care and adoption from this VIDEO. 4700 Virginia children and youth are in foster care. Check out the Virginia Adoption Awareness Month proclamation. children and youth in adoptive homes are more likely that peers in birth families to have special needs. More information about special educational needs and rights of adoptive families on our Fact Sheet. November is also Family Involvement in Education month. When parents and caregivers are engaged in their children's schools, everyone benefits! there are questions families can ask schools about teacher quality, safety, instructional quality, equity and other topics? Get the Checklist HERE. information for families about communicating on special education issues is available in many languages? Find information HERE. 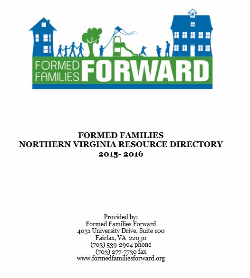 Find hundreds of organizations, businesses, and agencies to support your family! Download your free copy HERE. Hard copies are available at printing cost of $12 per directory; contact us to order. How has IDEA impacted your family? Share your story! The US Department of Education is celebrating the 40th anniversary of the Individuals with Disabilities Education Act, which guarantees special education and related services are available to eligible children and youth with disabilities. Tune in or attend the celebration events on November 17. Learn more HERE. Thank you to all the parents and caregivers who joined us for our four-session workshop on recognizing and addressing fetal alchohol spectrum disorder and other neurobehavioral conditions, which concluded on November 5. National FASD expert Melissa Elligson shared great research-based information, strategies and materials for families, educators and other professionals. Learn more about "brain-based" approaches for supporting children and youth who often exhibit very challenging and frustrating behaviors at our resource webpage. Q: I am a grandmother raising two of my daughter's children. Their mom is struggling with addiction and cannot care for the girls now. Their father was living with them until he was sent to prison 18 months ago. The girls want to see him and I take them to visit him but I am not sure how best to handle their questions and how to let him still feel involved with his daughters. Suggestions? A: First, you are not alone! Research has found that 7% of children and youth have lived with a parent who has gone to jail or prison. Having an incarcerated parent can impact children's academic, social, mental health and financial stablity. An effort across federal agencies is focusing on the needs of families impacted by incarceration. LEARN MORE about resources, including a webinar for educators and a guide for child welfare agencies. Seasame Street toolkit Little Children, Big Challenges: Incarceration. Mommies and Daddies in Jail book and other resources. Thanks for these Trainings and Events! We are grateful to be able to share these events hosted by other organizations and agencies around the region and state. November 9 - PEATC hosts a coffee with Hank Millward from the Virginia Department of Education, Falls Church. November 13- Strategies to Support Elementary Students with Dyslexia, Dunn Loring. November 16 - Setting Up an Augmentative and Alternative Communication (AAC) Friendly Home, Arlington. November 17 - Next meeting of Stronger Together peer groups for youth & young adults and for parents/caregivers, Fairfax. November 17 - IDEA 40th anniversary celebration. Broadcast live. November 18 - Dyslexia and Other Reading Disorders, Alexandria. December 1 - Paper Tigers film screening, Fairfax Government Center. January 12-13 - Kinship Treatment Foster Care Summit, Richmond. January 14 - Dude, Where's My Transition Plan? workshop for teens and parents/ caregivers, Fairfax. During this month of Thanksgiving, we at Formed Families Forward take a moment to recognize some of the wonderful people who support our work all year long. Thank you to our fabulous Board members: Patricia Czajkowski, Joy Koeppen, Lisa Mathey, Amy Fortney Parks, Dee Robinson, Tim Rosado, Angela MW Thanyachareon, and Rhonda Thorpe. Thanks to staff members Sarah Smalls and Danielle Bailey for their ongoing efforts. This past year we have benefitted greatly from time and energy from several interns and key volunteers: Whitney Emerson, Nida Liaqat, Jeana Adams, Logan Murtha, and Jasmine White. We appreciate all our wonderful partners at state and local organizations and private and public agencies. We deeply value the opportunity to serve children, youth and their adoptive, foster and kinship families through our collaborations with you! Best wishes to all for a happy, safe Thanksgiving holiday! Trauma-informed schools make a difference! Fairfax County’s Trauma Informed Community Network invites the community to a free screening and discussion of Paper Tigers on Tuesday, December 1, at 6:30 pm at the Fairfax Government Center. The documentary features an alternative school that radically changed its approach to disciplining students. Learn more and register for the event HERE.